Hovi Care has a long history on utilizing the nature for the benefit of the wellbeing of its clients. One concrete example is the Wellness trail. We have been using the Wellness trail in Pitkäniemi for years and saw the benefits in our clients. That was the reason why we wanted to introduce it in Singapore as well. 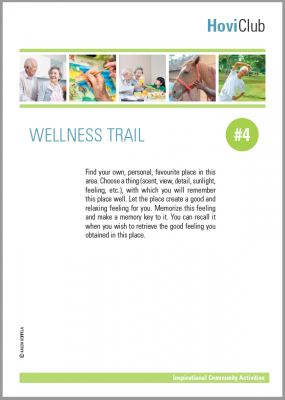 Wellness trail is a predefined path with nine checkpoints. The checkpoints have mental exercises, which help relax and the sooth the mind in the midst of nature. Wellness trail and the checkpoints are based on scientific studies. Research studies which been conducted in several countries show that spending time in nature increases positive feelings and reduces negative emotions, such as depression and anxiety. Also, awareness and alertness improve in nature. The effects are especially strong with people who feel stressed. On top of the benefits for the mind, nature also has positive effects on the body: the physiological rehabilitation starts in just a few minutes, blood-pressure drops and muscular tension is reduced. The Wellness trail is designed by the professor of environmental psychology, Mr. Kalevi Korpela from the University of Tampere. He has been studying the effects of nature on wellbeing and rehabilitation for a long time and has published several articles about it. In his latest publication, Can Nature Walks With Psychological Tasks Improve Mood, Self-Reported Restoration, and Sustained Attention? the research group examined engagement with the environment by asking participants to complete similar kind of psychological, restoration theory-driven tasks as on the Wellness trail, designed to enhance physiological, effective and attention restoration while walking on nature trails. The findings support both well-known theories in Environmental psychology: Stress reduction theory and Attention restoration theory and imply that some forms of active engagement with the environment can aid effective restoration and also enhance the ability to sustain attention, in particular. Our Wellness trail is in almost daily use. It is also accessible by others in Hovi Care Horsecity so, please come and see how active engagement with the environment can help you reduce stress and improve your wellbeing! Our Hovi Club at Horsecity is all about interesting activities. Come and try equine therapy yourself!